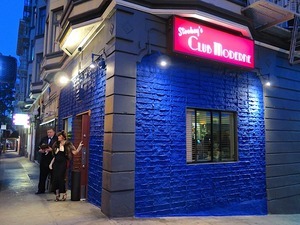 Streamline glam outside Stookey’s Club Moderne. Photo: © tablehopper.com. This Wednesday December 21st is the shortest (and darkest) day of the year, and ~EL TECHO~ is hosting a Winter Solstice party on its (covered and heated) roof from 4pm-close (10:30 pm). There will be three $5 cocktails from El Techo/Lolinda bar manager Alvaro Rojas, including the Agua Quemada (served hot! ), with black tea-infused mezcal, aged cachaça, all-spice, lemon, molasses, hot water; (no es mi) Presidente, with Haitian rum, Cognac, curaçao, French vermouth, cherry; and Ponche de Almendras, with mezcal, amaretto, cherry heering, orgeat, lime, grapefruit. All proceeds from cocktail sales (from the special cocktail menu) will be donated to La Cocina; first come, first served. 2516 Mission St. at 21st St., 415-550-6970. This is definitely the week to enjoy holiday cocktails, and I’m happy to see that ~STOOKEY’S CLUB MODERNE~ is going to be putting together a punch bowl of Tom and Jerry cocktails around 10:30pm to 11pm or so on Christmas Eve. Come on by, but last call is at 12:30am. 895 Bush St. at Taylor.